It has been a while since I wrote here, and the reason was that I was away for a nice family vacation. It was a truly wonderful experience, in the midst of good weather, the beauty of nature and great company – a meeting of like minds, a time to relax, the agenda being no agenda. It made me wonder whether having no agenda is the reason one enjoys vacations so much more than work. 🙂 We had a number of long unhurried discussions on everything from work, investing, achievements to marriage, travel and life itself. That brings me to one of the topics we discussed and the key topic of today’s post – the stark similarity between what I reckoned to be the driver of success in investing as well as achievement – the single magic phenomenon of compounding. 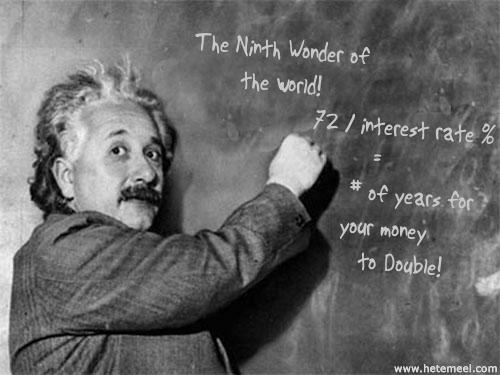 Everyone knows that Einstein called compound interest the eighth wonder of the world. Most people would also have heard the story of the poor farmer who robbed the rich king in less than three months, when he asked to be given food starting with a single grain today, just doubling the number of grains every day. A recent book called “Outliers” had a similar “Compounding” explanation for super achievement. The author argued that there was no real secret to superlative achievement – people whom he called “Outliers” going by the statistical term. While we always like to give credit of super success to things like inborn talent, genius or luck, the answer in the author’s view was a set of circumstances that simply led the “Outliers” to put in the number of hours required to be “Outliers” – and in his view, what looks like genius starts surfacing after 10000 hours of working at the same thing. Which means most “Outliers” need to start early in life in their area of work, need to really love that thing a lot to be able to put in the necessary daily grind, and need to consistently keep at it for a long time to reach a level of excellence that looks like genius to other normal individuals. That does not seem too different from the drivers of investing success. For compound interest to work, one needs to give it sufficient runway, which means start early. Secondly, unless one really loves finding a good deal or is wired with the right temperament to go through inevitable ups and downs of the economy, one is unlikely to keep at it. And finally, the true effects that start looking like investing genius, sometimes simply due to the mathematical magic of compounding – will start coming in only when keeps doing it for a long period of time. Start Early, Love the Journey, Keep at It for long periods of time. The sad reality is very few people are so placed to be able to meet all the three drivers perfectly. That is, perhaps, the reason why we have so few super achievers and so few super investors.